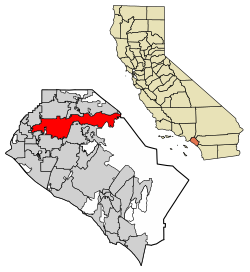 Location of Anaheim in Orange County, California. 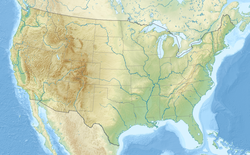 ↑ "California Cities by Incorporation Date". California Association of Local Agency Formation Commissions. Archived from the original (Word) on November 3, 2014. สืบค้นเมื่อ August 25, 2014. ↑ "Anaheim Mayor Tom Tait". City of Anaheim. Archived from the original on September 10, 2014. สืบค้นเมื่อ October 31, 2014. ↑ "Communities of Interest - City". California Citizens Redistricting Commission. Archived from the original on September 30, 2013. สืบค้นเมื่อ September 24, 2014. ↑ "Communities of Interest - City". California Citizens Redistricting Commission. Archived from the original on October 23, 2015. สืบค้นเมื่อ September 24, 2014. ↑ "2016 U.S. Gazetteer Files". United States Census Bureau. สืบค้นเมื่อ Jul 19, 2017. ↑ "Anaheim (city) QuickFacts". United States Census Bureau. สืบค้นเมื่อ February 4, 2015. ↑ "Population and Housing Unit Estimates". สืบค้นเมื่อ July 7, 2018. ↑ "ZIP Code(tm) Lookup". United States Postal Service. สืบค้นเมื่อ November 18, 2014. ↑ "E-1 Population Estimates for Cities, Counties and the State with Annual Percent Change – January 1, 2005 and 2006" (PDF). California Department of Finance. May 1, 2006. Archived from the original (PDF) on September 23, 2006. สืบค้นเมื่อ November 16, 2006. หน้านี้แก้ไขล่าสุดเมื่อวันที่ 11 มกราคม 2562 เวลา 11:56 น.